In 1947 the Township of Medford approached the Medford-Vincentown Rotary Club with the intent of having an event during mischief night/ Halloween period to provide the young people of the town an alternative activity in which to participate. With World War II just ending and the country still in a very patriotic mood, the idea of a parade was quickly embraced. The first parade consisted of costumed marchers, a few floats, a couple of fire engines and a band. The parade has grown every year and has become one of the most cherished traditions in the community. The parade now boasts over 10 marching bands, 40 hand built floats, hundreds of costumed marchers and draws in excess of 20,000 spectators yearly. The parade has been a labor of love to many members of the Rotary Club over the years, some of which participated in the first. 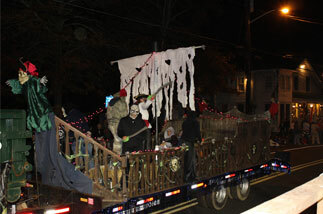 The parade is the single largest yearly undertaking by the club and serves as its biggest fundraiser. 100% of the funds raised from the parade go directly to the many community projects and scholarships sponsored by the Medford-Vincentown Rotary Club.